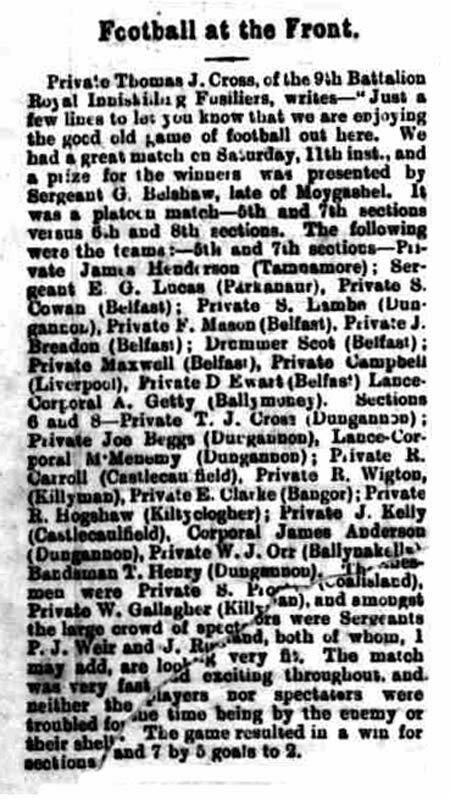 The subs were Private S Proctor (Coalisland) and W Gallagher (Killyman), and amongst the large crowd of spectators were Sergeants P J Weir and J Ringland, and both of whom, I may add, are looking very fit. The match was very fast and exciting throughout, and neither the players nor spectators were troubled for the time being by the enemy or their shells. The game resulted in a win for sections 5/7 by 5 goals to 2.